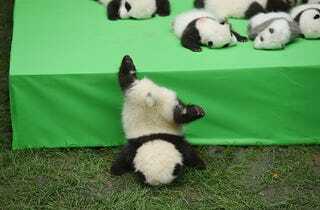 Good evening, I was searching high and low for a story to leave you with tonight, but all I could find was this video of 23 newborn pandas vying for supremacy, or perhaps just flailing blindly, during a baby animal presser at China’s Chengdu Research Base of Giant Panda Breeding on Thursday. Is that ok? One of the tiny cubs fell off the green stand upon which its comrades were placed for their close-up. It fell face first, but wasn’t injured. Possibly because its face is so fluffy, though I’m no expert. What I do know is that it is infinitely better than Taylor Swift’s rude cat or whatever else I might have written about instead.